Attention Sinatra, Rat Pack, Swing fans, the show returns with a stunning new revamp for 2019 that will thrill all. 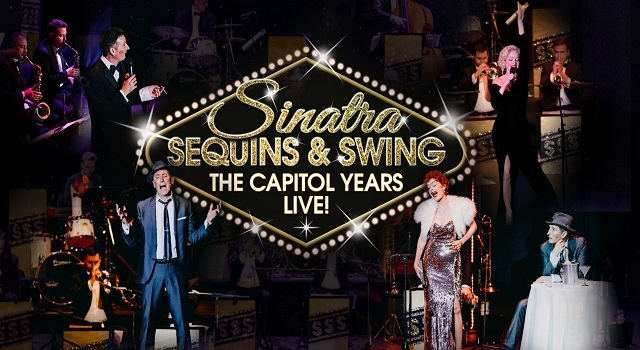 The spectacular-sounding, visually-evocative Sinatra production like no other, and only UK Sinatra production endorsed by President of Sinatra Music Society, includes Frank Sinatra himself reliving his iconic hits, vocal majesty, and the Hollywood glamour of his sensational Capitol Records years of 1953-61, with plenty of fun in between. Expect the greatest hits, like Chicago (That Toddlin’ Town), Lady Is A Tramp, Come Fly With Me, It Happened In Monterey, All The Way, I’ve Got You Under My Skin, Too Darn Hot, Fever & more. As well as recreations of Sinatra’s famous movie song scenes, a vocally mesmerising Marilyn Monroe, his stunning Capitol stablemate Peggy Lee, some swingin’ Bobby Darin and a surprise guest. The talent and charisma of the show’s two main stars has mesmerised audiences worldwide. Similarly, the impact of the Capitol Orchestra, featuring soloists from Ronnie Scott’s Big Band/BBC Big Band, hypnotises newcomers and avid fans of the era. “Be sure to see it. You won’t find a better evening’s entertainment anywhere” says the President of the Sinatra Music Society. “The best show I have ever seen at Epsom Playhouse” – T Williams, Epsom.